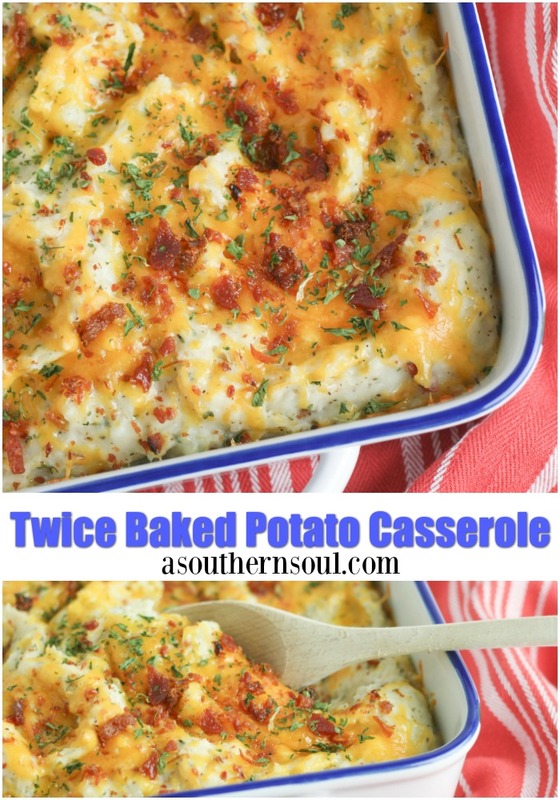 Twice baked potato casserole is new twist on stuffed baked potatoes! 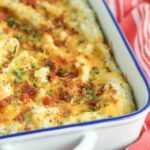 Loaded with cheese and bacon, these potatoes make a great side dish for a weeknight meal or Sunday supper yet fancy enough for the holidays. 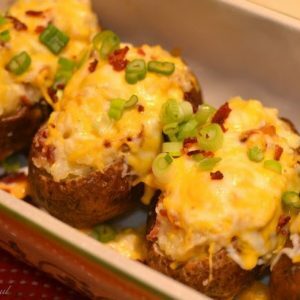 For years I’ve been making twice baked potatoes. My family loves them and they’ve been known to eat them for just about any meal of the day. I say this because my oldest son loves twice baked potatoes for breakfast along with his eggs. I’m good with that but honestly, I’m not a fan of making stuffed baked potatoes first thing in the morning. Since I have a small attitude problem regarding these taters, I finally got my act together and came up with the perfect way to serve these yummy spuds without all the work! 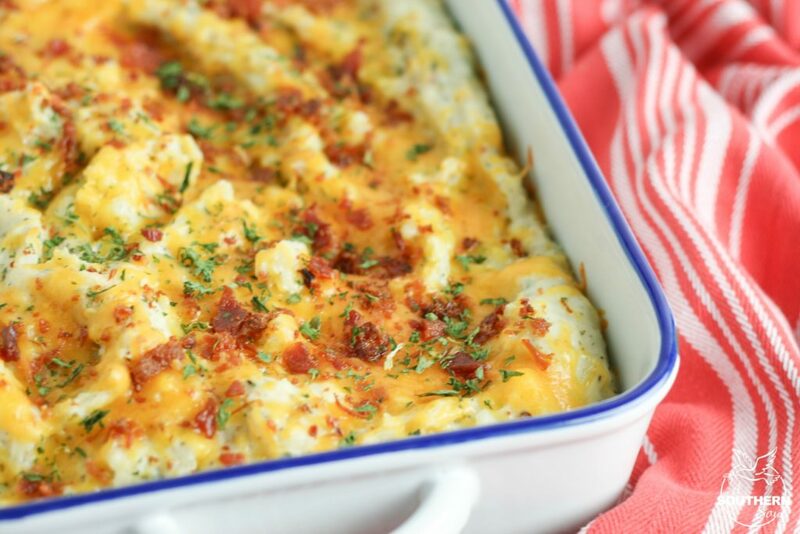 I’ve turned my traditional, much loved twice baked potato recipe into a casserole. When I came up with this idea, I actually laughed out loud because I kept thinking how silly it was that I’d never thought of this before. 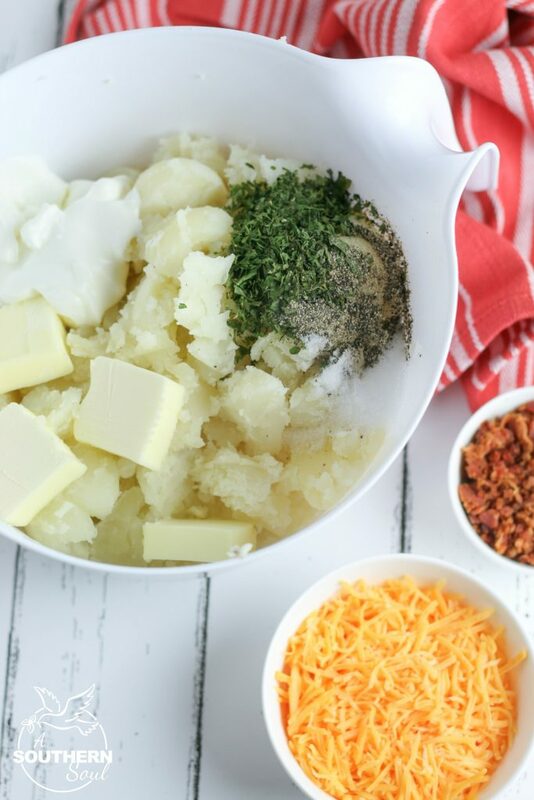 Just bake the potatoes, scoop out the middle, add in all the good stuff then bake it all together. Boom!There ya have it. 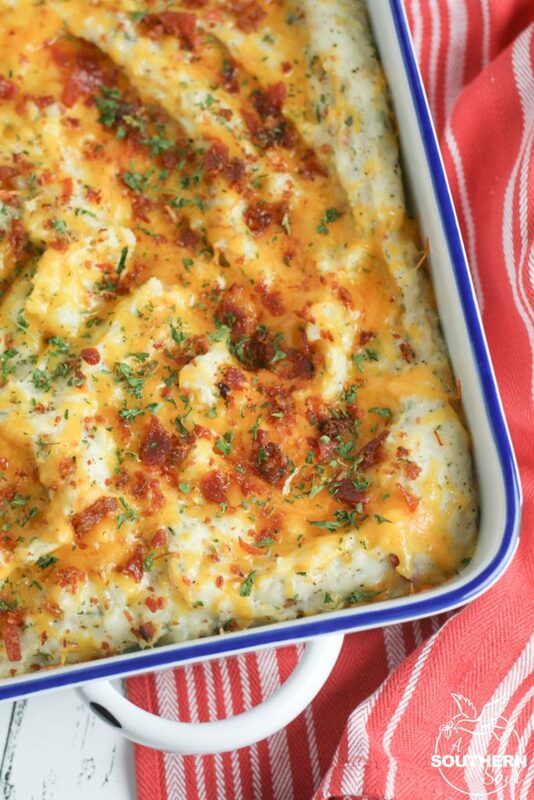 For my stuffed potato casserole, I keep things simple, just like I do when I “twice” bake them. 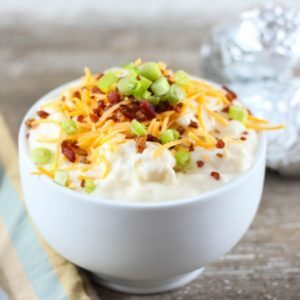 Butter, sour cream, cheese and bacon are the all star ingredients. The only other thing that’s needed is just the right amount of salt and pepper. After all my filling is mixed together, instead of putting it back into the potato skins, I just pile it into a casserole dish and smooth it out. But hold on…I don’t stop there, I add more bacon and cheese on top to bring the whole thing together. After baking up my casserole, I sprinkle on a bit of chopped parsley and serve. 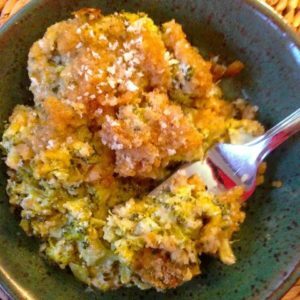 I do add a decedent twist to the casserole when I serve it for company and the holidays. I add fresh chives to sour cream to serve along side my casserole. 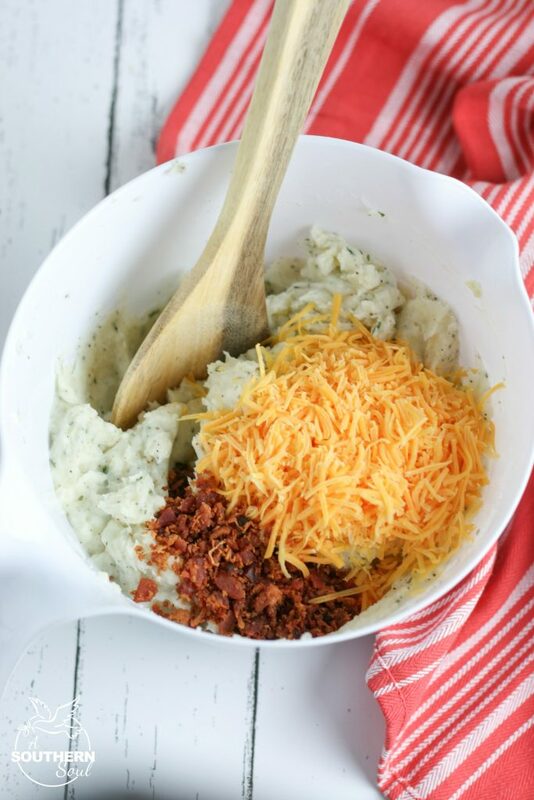 This is a terrific side dish that does double or maybe even triple duty in my house and I proudly serve it any time of the the day all year round! Preheat oven to 350 degrees. Cut baked potatoes lengthwise and remove cooked potato from skin. Combine cooked potato, parsley, pepper, salt, milk, sour cream, and butter in a large bowl and beat with mixer until fluffy. 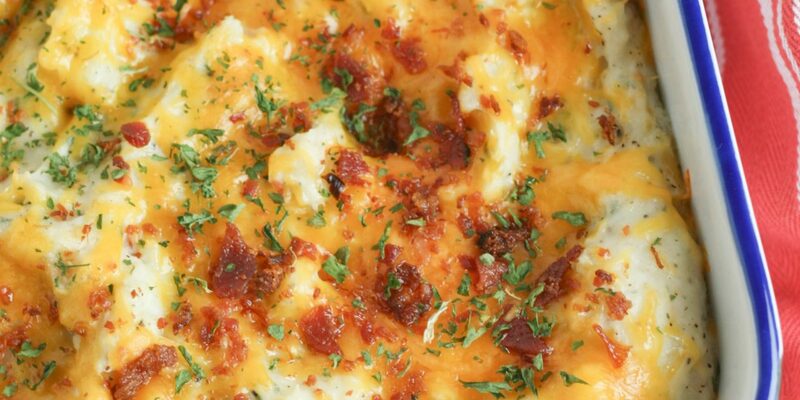 Add ½ cup cheese and half of chopped bacon and mix with a spoon until combined. 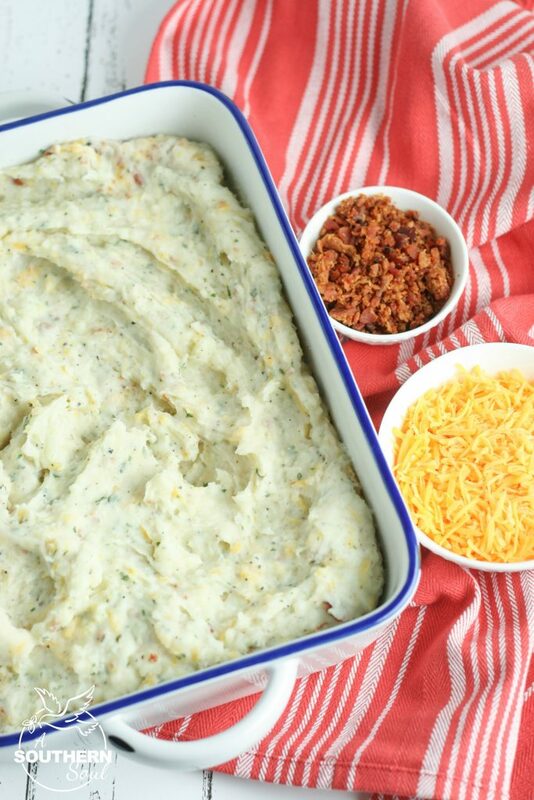 Spread potato mixture evenly in a casserole dish. Top with remaining cheese and chopped bacon. Bake for 20 minutes. Remove from oven and garnish with additional parsley, if desired. *** Add additional chives and sour cream if desired. What size of baking dish? Thank you. Hey Cathy. I think I responded on FB but wanted to let you know I use a 9X11. Hope you enjoy the recipe! Ingredient question, is it parsley or chives? The list of ingredients calls for parsley but the note at the end of the directions says you may add additional chives and sour cream. I actually use both. Sorry for the confusion! My son and I love fresh chives so they’re always on my mind when I make potatoes. I assume you’re using russet potatoes? Yes, you are correct Cheryl. I hope you enjoy the recipe. Please let me know. Where can I get the casserole dish in your picture?. I love it!. 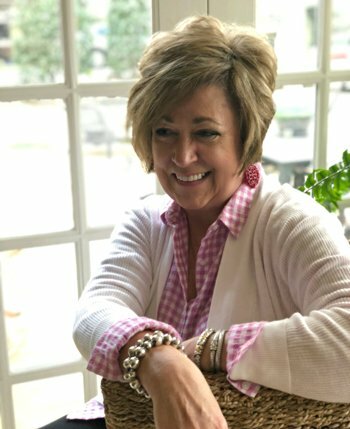 I have made so many of your recipes and they have all been wonderful, thank you for making my life tastier! 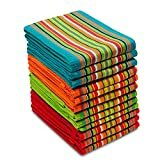 Can you make this a few days in advance. Hey Brenda. 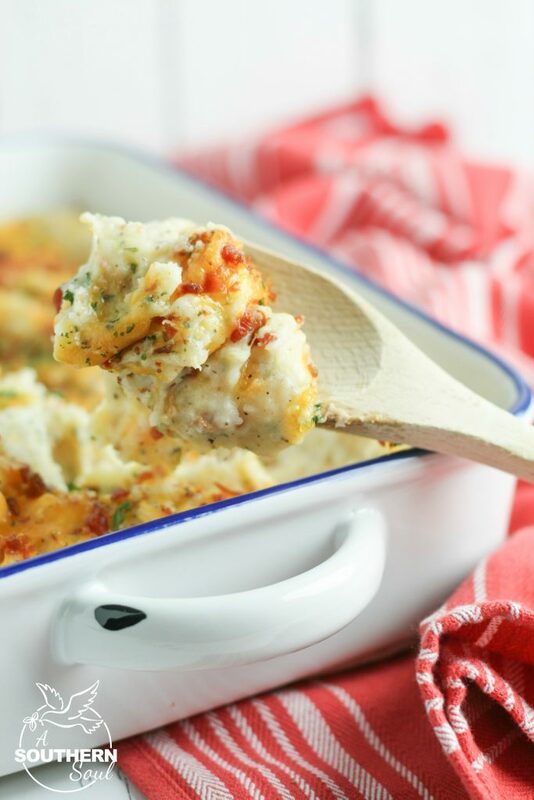 Yep, you can make the casserole ahead of time and it freezes like a dream. Enjoy!